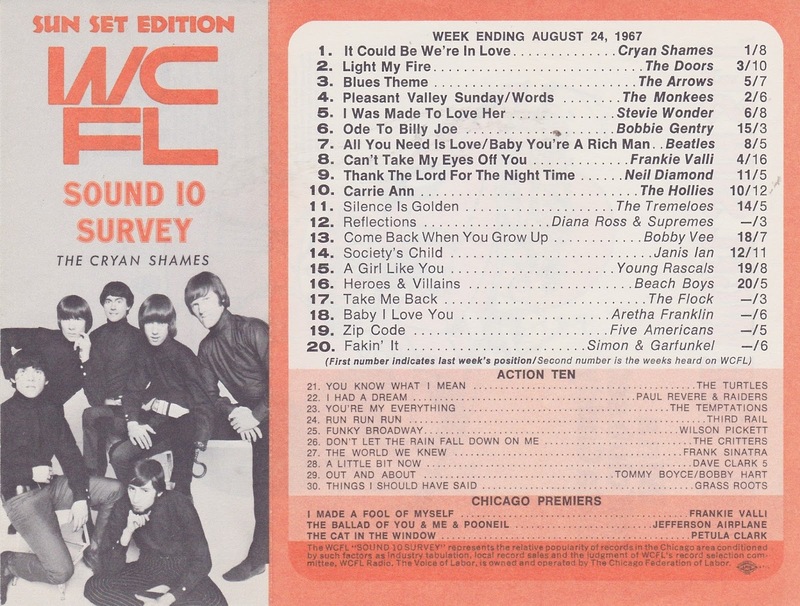 Chicago's Cryan' Shames top the local charts yet again this week ... and even get their picture on the cover of WCFL's Sound 10 Survey. Jim Pilster (Hooke) told me that he hates the record "Ode To Billie Joe" by Bobbie Gentry to this day because it was the song that finally knocked them out of the top spot on the charts after a four week run. 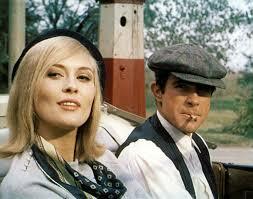 (I think he would have thrown her off The Tallahatchie Bridge if given the chance!) But there was no stopping this one ... Gentry's hit would become one of the year's biggest ... and remains a timeless classic ever since. 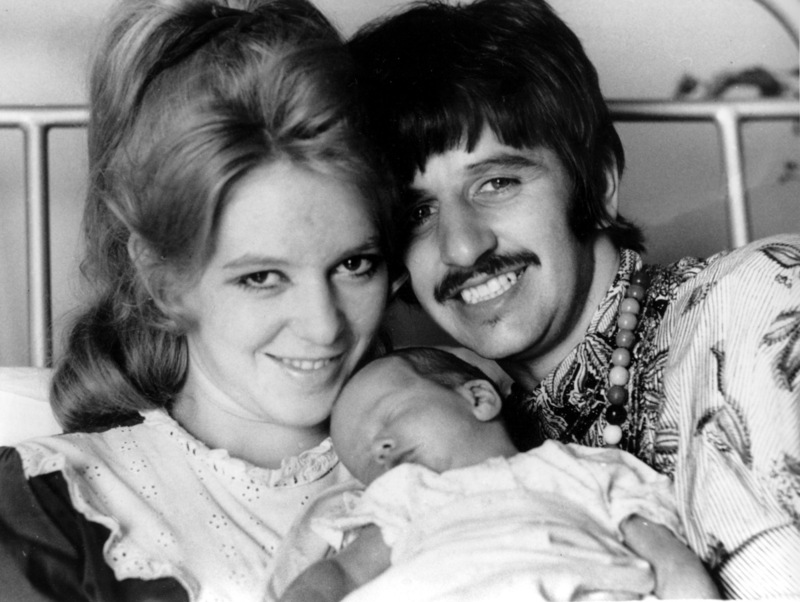 Ringo Starr's wife Maureen (Starkey) gives birth to their second son, Jason. Top debuts this week include a couple more personal favorites … "Gimme Little Sign" by Brenton Wood debuts at #76 and right behind it Paul Revere and the Raiders are new on the chart with "I Had A Dream" (#77). Chicago's Spanky and Our Gang are back with "Making Every Minute Count" (new on the chart at #72) and Dean Martin's got an appropriately titled novelty track out this week, too … "Little Ole Wine Drinker, Me" premiers at #82. Meanwhile, despite already topping both the WLS and the WCFL chart here in Chicago, The Cryan' Shames are still just creeping up the national chart this week, moving from #90 to #83 with "It Could Be We're In Love". 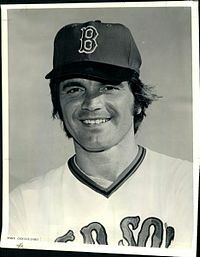 Slugger Tony Conigliaro of The Boston Red Sox is hit on the left cheekbone, just below the eye socket by a pitch thrown by California Angels Pitcher Jack Hamilton. He will miss the rest of the 1967 season as well as all of the 1968 season. Frankie Valli and The Four Seasons perform the first of two shows (they'll be back tomorrow night, too) at Chicago's Civic Opera House. We've got several other records making a leap of ten spots or more outside The Top 40 this week, starting with "Blue's Theme" by Davie Allan and the Arrows (#55 to #45), "You Know What I Mean" by The Turtles (#62 to #46), "The Windows Of The World" by Dionne Warwick (#60 to #47), "Funky Broadway" by Wilson Pickettt (#75 to #48), "Everybody Needs Love" by Gladys Knight and the Pips (#61 to #50), "There Is A Mountain" by Donovan (#87 to #52), "Higher And Higher" by Jackie Wilson (#70 to #53), "Jill" by Gary Lewis and the Playboys (#68 to #54), "Groovin'" by Booker T. and the MG's (#71 to #58), "The Letter" by The Box Tops (#82 to #63), "Things I Should Have Said" by The Grass Roots (#76 to #64), "Zip Code" by The Five Americans (#96 to #73), "Sixteen Tons" by Tom Jones (#95 to #79), "Lady Friend" by The Byrds (#99 to #85) and "You've Got To Pay The Price" by Al Kent (#98 to #86). Gary Puckett and The Union Gap (initially billed as The Union Gap featuring Gary Puckett) record what will become their first hit record, "Woman, Woman". Three songs will be recorded during their very first Columbia Records recording session ... "Believe Me," which Puckett wrote; "Woman, Woman," by Jim Glaser and Jimmy Payne; and "Don't Make Promises," written by Tim Hardin. Jerry Fuller produced the recording session, with musical arrangements by Al Capps. The Union Gap was a group of multi-talented musicians. Kerry Chater played bass and keyboards; Gary Withem played keyboards, clarinet, and sax; Dwight Bement played keyboards, clarinet, sax, guitar, and bass; Gary Puckett switched back and forth between bass, guitar, and keyboards; and everyone sang, including drummer Paul Wheatbread. "It was a very talented band. 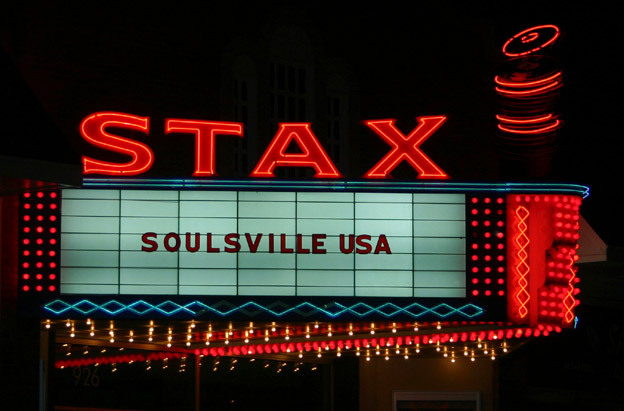 During concerts, we enjoyed impressing the audience by switching instruments," Puckett told authors Marti Smiley Childs and Jeff March for their first book, "Echoes of the Sixties." Glen Campbell records "By The Time I Get To Phoenix" and "Hey Little One" at The Capitol Tower Recording Studio in Hollywood, California. Micky Dolenz, Peter Tork and Michael Nesmith attend a Booker T and the MG's Stax recording session in Memphis, TN. A plaque commemorating their visit will later be affixed to the studio's museum wall with the inscription "They just wouldn't leave!" That night The Monkees perform a show at The Mid-South Coliseum in Memphis. Although they were invited to visit Graceland after the concert they decline to go as Elvis was currently in Los Angeles. Rounding out The Top 40 (with moves of ten positions or more) are "Fakin' It" by Simon and Garfunkel (up from #38 to #25), "Come Back When You Grow Up" by Bobby Vee (#42 to #29), "Apples, Peaches, Pumpkin Pie" by Jay and the Techniques (#57 to #30), "San Franciscan Nights" by Eric Burdon and the Animals (#53 to #34), "The World We Knew" by Frank Sinatra (#45 to #35) and "Brown Eyed Girl" by Van Morrison, which climbs from #54 to #39. On August 15, 1967, Columbia Records released Billy Joe Royal's recording of a Joe South composition that would send Royal back onto the chart after an absence of nearly a year -- but the song would become a much bigger hit a year later for the British power band, Deep Purple. That song was "Hush." The Woody Herman big band and singer Donnie Brooks also recorded versions of "Hush." Capitalizing on Billy Joe's return to the chart, Columbia released his second album, titled "Billy Joe Royal Featuring 'Hush,'" which included the title track as well as "Yo-Yo" (later a huge hit for The Osmonds) and "Heart's Desire." Billy Joe turned down another Joe South composition that he regrets. "Joe played it for me one day, and I told him it was okay, but I wasn't interested," Billy Joe told authors Marti Smiley Childs and Jeff March for their book "Where Have All the Pop Stars Gone? Volume 3." The song he declined was "Rose Garden," which Lynn Anderson turned into a top-10 pop-country crossover hit in late 1970. Still, it had to be an exciting time ... and there's always a little more intrigue when you feel like you're getting away with something, isn't there?!?! I asked British DJ Geoff Dorsett to say a few words on Pirate Radio. He grew up in the UK during those turbulent '60's when the pirates ruled the British airwaves ... and years later became a successful disc jockey himself. I wanted to hear it from HIS perspective as to how this innovative listening alternative came and went. 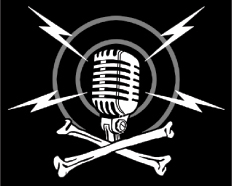 (Geoff even recorded his own radio special on pirate radio ... link below ... and, of course, you can always check out the movie, too!) Read on! In the 1960's, the radio world in UK was very different. You had little choice. You either bought records to play them at home or you listened to Radio Luxembourg with its poor reception. The BBC had its Light Programme, which had few all record shows. Those with experience of US radio spotted a gap in the market and a range of pirate stations were set up to broadcast all day pop music. Although illegal, because they paid no copyright fees for the music that they played, they soon developed a huge following, particularly among the youth of the country. In 1965, the BBC started to respond but failed due to the over-produced, over-scripted radio shows and did not match the free flowing, easy ad-libbing pirates. From 1964 - 1967, Pirates ruled. The main two pirate stations were Radio Caroline and Big L (Radio London). 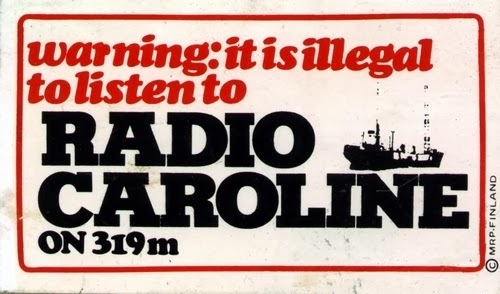 Radio Caroline South started broadcasting 28th March, 1964. Founded by Irish businessman Ronan O'Rahilly to circumvent the record companies control over pop music in the UK, the ship was a 702 ton former Danish car ferry, anchored off the coast of Felixstowe. The ship was named after President Kennedy's daughter. They had a Top 40 format with the slogan "your all day music station". Radio Caroline also had Caroline North off Isle of Man. The ships were called MI Amigo. 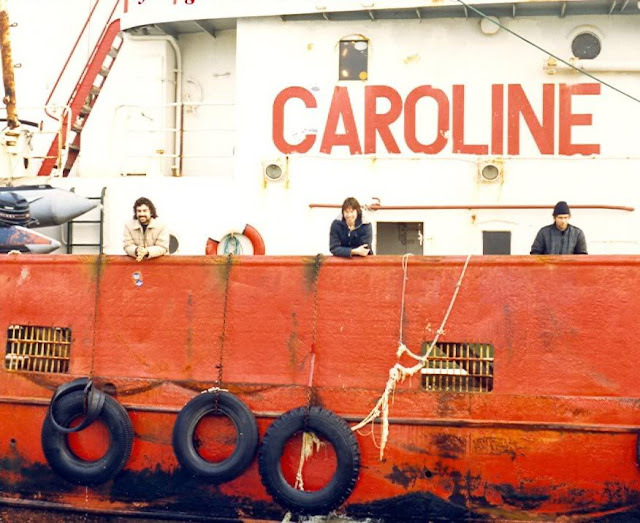 Radio Caroline was run by people from the music business to provide a platform for artists and records. Its daily audience was 1.1 million. Its main DJ stars were Johnnie Walker, Roger Day, Keith Skues, Tony Prince and Dave Lee Travis. When the Marine Offences Bill came into rule on 14th August, 1967, and outlawed the pirates, most of the presenters left to join land-based legal radio stations. But Caroline carried on for some time, surviving in a weakened form. Radio London (BIG L) was the brainchild of an American car dealer, Don Pierson. Its first broadcast was 23rd December, 1964, and it, too, closed down on 14th August, 1967, when the Marine Offenses Bill came into being. Radio London used an American Minesweeper 780 ton vessel renamed MV Galaxy. It dropped anchor off Frinton on sea, outside the 3 mile limit . It was run by sales people who were more business-like. The daily listenership was 2.17 million. It had many star presenters, most famous John Peel, Kenny Everett, Dave Cash, Tony Blackburn and the legendary Tony Windsor. It used Pams jingles from Dallas and was very slick. When the British government brought in the bill to close them down, it was the worst day in British radio history. A radio show I did with some of the songs made into hits by Pirate radio is here, along with interview clips of three of its DJ'S. The three hour radio show Pirate Radio had some interview clips from three guys who were on "the ships" ... two on Caroline and one on Radio London. The one hour program contains hits made famous by the pirates. British Forgotten Hits Reader Geoff Lambert (Rockin' Lord Geoff) ALSO chimed in on this topic ... this had to be a pretty exciting time in the UK ... it's always a little more thrilling when you feel like you're getting away with something ... especially something as pleasurable as the rock and roll music of the mid-to-late '60's!!! Here you are, Kent ... as they say, if you can remember then you weren’t there hence why my memory is a bit hazy lol. The pirate radio days, oh they were good old days, Kent. I remember the day they started. We in the UK had heard nothing like this radio format before. I guess it is fair to say in the Brit’s eyes rather Americanised presentation but then we did have the likes of the Emperor Rosko (he is the son of Hollywood film producer Joe Pasternak) who started out sounding like Wolfman Jack who prior to American Graffiti I doubt if anybody in the UK knew what the Wolfman sounded like. The first Pirate station was Radio Caroline, the brainchild of the Irishman Ronan O'Rahilly. This was followed by probably the best know radio station, Radio London, also known as Big L and Wonderful Radio London. Radio Caroline, like Radio London, was anchored some three and a half miles off the coast of Essex in the far too frequent stormy and volatile North Sea. Radio Caroline broadcasted from the M.V. Caroline and Radio London from the M.V. Galaxy which was a former second world war US minesweeper. Records were shipped out to the Pirate ships and played by unknown DJ’s like Tony Blackburn, Kenny Everett, Dave Cash, Simon Dee and Ed “Stewpot” Stewart who, along with many others, enjoyed very successful careers in “legitimate” radio when the Pirate ships were scuttled by the British Government with the Marine broadcasting offense act of 1967 which effectively was the death knell for most of the station although Radio Caroline did continue on and off for several more years. One of my clearest recollections was one summer evening while on holiday on the Essex coast near the city of Frinton on sea listening to, I believe, Spangles Muldoon, one of the DJ’s. He was commenting on how smooth the sea was that night and how romantic the lights of Walton on the Naze looked from the loneliness of the ship. He asked people to drive to Walton on the Naze headland and at an agreed time would they all switch on their car headlamps so he could see how many people were listening to his show. An hour or so later he gave the signal to switch the headlights on expecting to see a few lights but he was not prepared for the hundreds of people who were on the headland flashing their car headlights towards the ship. In their glory days it was the only way to listen to the radio as the staid old BBC found out when their listeners abandoned them for the Pirates who in turn were helped just by the fact they were right in the middle contributing in no small way to the music boom we all know as the swinging sixties. While American teenagers were grooving all day long to Beatlemania on transistor radios in early 1964, there was no equivalent in the UK. The BBC had a monopoly on radio and had small regard for teenage music. Purchasing power was with adults so music was very conservative. And contracts with the musicians' unions specified that most music heard on radios would be live from the studio. Only the BBC's Light Programme network had a minimal amount of "needle time". Otherwise if you heard the teen hits of the day at all on the radio, they were sometimes performed by studio musicians instead of the originators. The only alternative was Radio Luxembourg where the major UK record labels bought small blocks of airtime. Compare it to today's infomercials where only portions of songs were heard so as to play as many as possible in a short time. Otherwise it was word of mouth that might send you to record shops like HMV on Oxford Street where you could listen in phone-like booths to records before purchase. 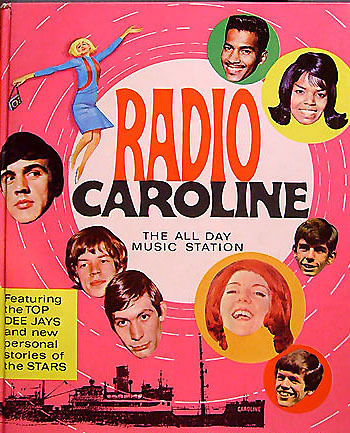 Then a musical revolution occurred when the pirate radio stations began broadcasting from ships outside UK territorial waters starting in late March, 1964, with Radio Caroline. Many of them financed by American investors, they adopted US Top 40 style formats with US made jingles. An American calling himself Emperor Rosko was one of the most celebrated of the pirate deejays. Then, in the summer of 1967, the British Parliament passed the Marine Broadcasting Offenses Act shutting down the pirates. In response to the popularity of the outlawed stations,the BBC set up it's own pop music network, Radio One, manned almost entirely by ex-pirate staff. When I got to London in 1968 with the US Navy there were three choices for hearing pop and rock music: BBC Radio One, Radio Luxembourg, and AFN. Radio Luxembourg had by then appropriated the pirate's style and AFN (the US Armed Forces Network out of Germany) played US Top 40 hits. It wasn't until 1973 that the BBC monopoly ended and independent commercial radio stations began broadcasting in the UK. The Beatles hold down both the #1 spot on the Top 100 Singles Chart as well as the Top Albums Chart. "All You Need Is Love" spends its second week at #1 on the singles chart and the Number One Album in America once again this week is "Sgt. Pepper's Lonely Hearts Club Band" by The Beatles … both would play a HUGE part of the soundtrack to The Summer Of Love … DEFINE it, if you will. Aretha Franklin climbs up eight spots to #4 with her latest, "Baby, I Love You" but the biggest mover in this week's Top Ten belongs to Bobbie Gentry, whose "Ode To Billie Joe" leaps from #32 to #8. "Silence Is Golden" by The Tremeloes also cracks The Top Ten for the first time this week, rising from #13 to #10. The newly-christened Diana Ross and the Supremes jump all the way from #50 to #19 this week with their latest, "Reflections," a move of 31 places. 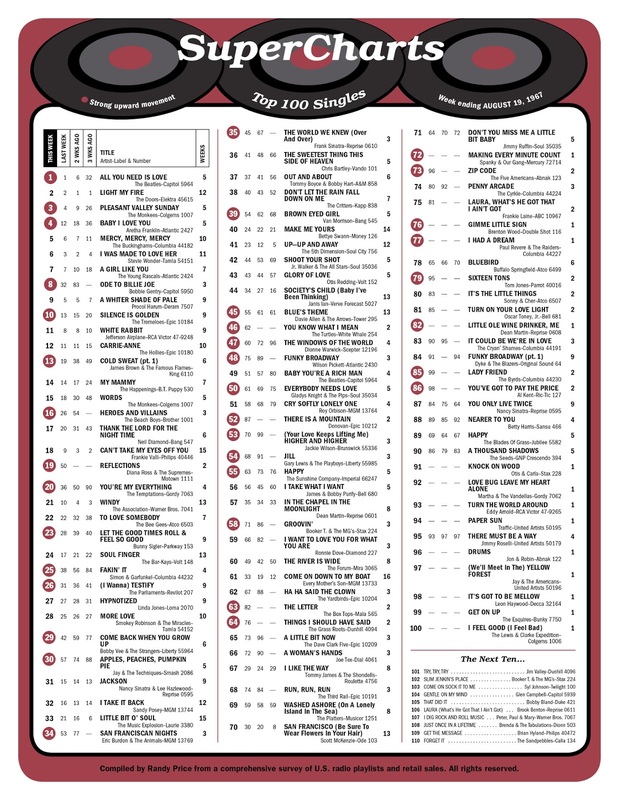 "You're My Everything" by The Temptations climbs 16 places from #36 to #20. "Heroes And Villains" by The Beach Boys is up from #26 to #16 and James Brown seems to have a hit with "Cold Sweat", which climbs from #19 to #13. Broadcasting at sea, Wonderful Radio London shuts down. When returning to London, fans are there with signs and placards that read "Freedom Died With Radio London". (see tomorrow's entry for more details) I'll be appearing this evening on British Presenter Geoff Dorsett's Program in the UK, discussing the end of the Pirate Ship Era. Speaking of The Monkees, this afternoon they make up for their cancelled appearance at Olympia Stadium in Detroit, MI, after riots forced the July 29th show to be postponed.